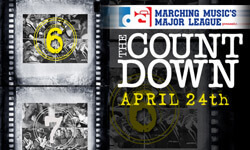 Coming to National CineMedia theaters across the U.S. on Thursday, April 24, Drum Corps International's spring cinema event, "The Countdown," will feature six full-length corps performances from among the 36 DCI World Championship finalists of 2005, 2006 and 2007. This year, drum corps fans will be able to check out this special cinema presentation from more than 300 select theaters across the nation. On the Web at DCI.org/countdown, you can search for the closest participating theater locations, view a "Countdown" movie trailer, check out the latest related dates and information, and more.